Researchers at UC Santa Cruz have developed a nanostructured composite material, which can be used as a catalyst for electrochemical splitting of water to synthesize hydrogen. An inexpensive, efficient catalyst is crucial for making hydrogen as a clean, environment-friendly fuel. A team headed by Shaowei Chen, professor of chemistry and biochemistry from UC Santa Cruz, have been analyzing the application of carbon-based nanostructured materials as catalysts for carrying out the reaction that synthesizes hydrogen from water. In a recent research, they achieved optimum outcomes by including ruthenium ions into a sheet-form nanostructure made of carbon nitride. Performance was further enhanced by integrating the ruthenium-doped carbon nitride with graphene, carbon in a sheet-like form, to produce a layered composite. 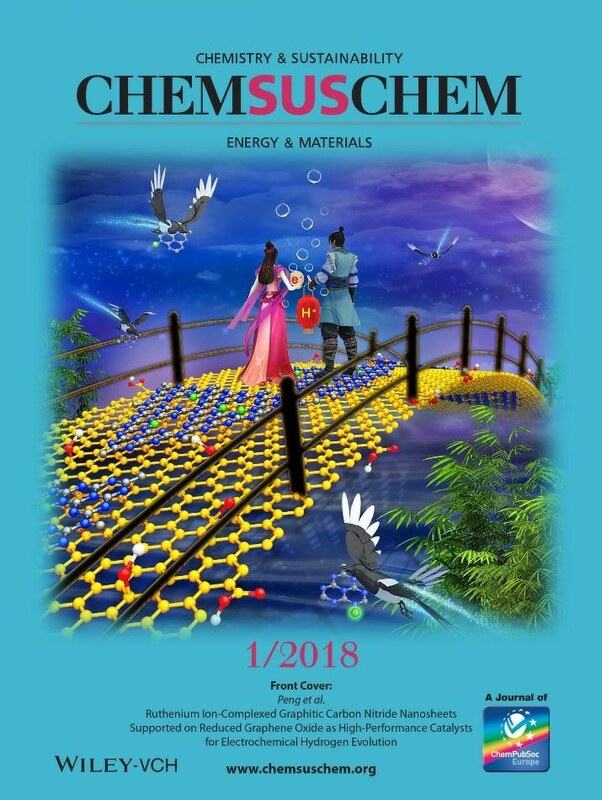 The new outcomes have been reported in ChemSusChem, a top journal reporting on sustainable chemistry and energy materials. The paper has been featured on the cover of the January 10, 2018 issue of the journal. Yi Peng, first author of the study and a graduate student in Chen’s lab, headed the study and designed the cover image. For many years now, hydrogen has been considered to be a renewable and clean fuel. For instance, a hydrogen fuel cell used for powering an electric vehicle discharges only water vapor. However, at present, hydrogen production is still largely dependent on fossil fuels - predominantly using steam to derive it from natural gas. Formulating an efficient, inexpensive method to derive hydrogen from water by means of electrolysis will be a significant advancement. Consequently, electricity produced by using renewable sources such as wind and solar power can be easily stored and distributed as hydrogen fuel. At present, the highly efficacious catalysts for performing the electrochemical reaction that extracts hydrogen from water are formed of platinum, which is costly and less abundant. Although carbon-based materials look promising, their performance is not comparable to that of platinum-based catalysts. In the case of the innovative composite material created by Chen’s lab, the ruthenium ions combined in the carbon nitride nanosheets alter the electron distribution in the matrix, thereby creating greater number of active sites for the binding of protons to produce hydrogen. If graphene is added to the structure, it further improves the redistribution of electrons. The graphene forms a sandwich structure with the carbon nitride nanosheets and results in further redistribution of electrons. This gives us greater proton reduction efficiencies. According to the authors, the composite’s electrocatalytic performance was comparable to that of commercial platinum catalysts. However, Chen observed that there is still a long path to tread before realizing efficient and inexpensive hydrogen generation. Apart from Peng and Chen, Wanzhang Pan and Jia-En Liu from UC Santa Cruz and Nan Wang from South China University of Technology are the coauthors of the paper. The National Science Foundation and the NASA-funded Merced Nanomaterials Center for Energy and Sensing supported this study.